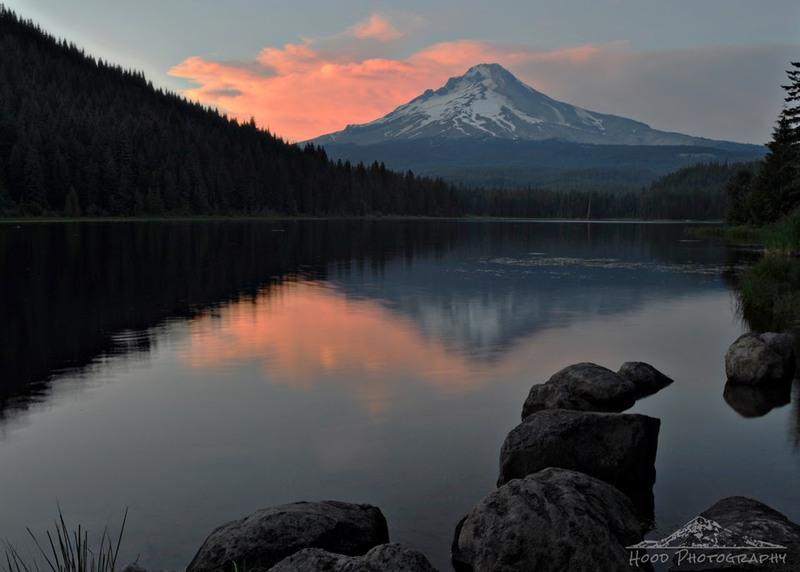 I do not visit Trillium Lake as much as I used to. There are just way too many people. Only a few years back, you could go for the day to sit on the bank and fish and enjoy the peacefulness that the mountain lake had to offer with a handful of other groups of people doing the same thing. Then they did some pretty major construction on the south side of the lake where the dam is, creating a large bank for people to hang out for the day. Sounds nice, but it made the crowds explode. There were hundreds of people crowded into the dam area at the small lake this past weekend when I visited for the first time of the year, and we only spent a short time before moving on to another lake. We prefer quieter outdoor experiences. I did return at dusk and captured this much more peaceful moment as the sun went down in the west. Nice sunset reflections. Yeah, I like to get away from the masses, so that's why I hike the far flung trails around here. The sunset is exquisite! I don't like crowds either. fabulous image. Wish I could see that view just once in person. An amazing image of a beautiful place. Love it. Visiting from ABC Wednesday. A wonderful place and a beautiful photo. Beautiful shot - so peaceful, and so well shot!